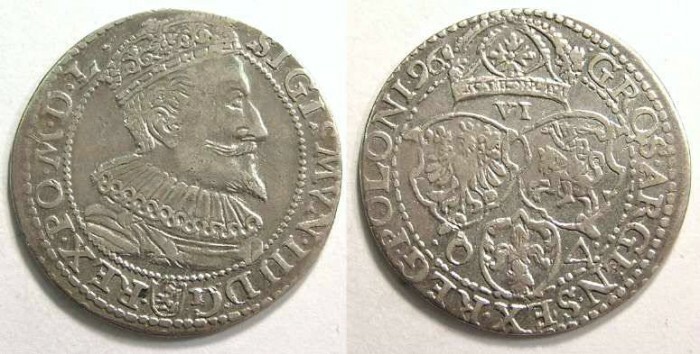 Poland, Sigismund III, AD 1587 to 1632. Denomination : Silver 6 Groszy. Date : 1596 Mint : Marienburg. Size : 27.2 x 27.5 mm. Weight : 4.77 grams. Obverse : Head of Sigismund III right, with SIGISMVN III D G REX PO M D L around, with a small lion on a shield breaking the inscription. Reverse : Crowned triple shields, with GROS ARGEN S EX REG POLONI 96 around with the denomination mark VI between the crown and the shields, and and the mint control marks in the lower right and left fields.